CONARKY, Guinea – How many community health workers (CHWs) are there? What are community health workers’ tasks? How can we more efficiently integrate CHWs into national health systems? Global public health leaders widely acknowledge that there are not enough health workers in the world. Tragically, this fact has been further highlighted by current state of the Ebola epidemic in West Africa. With over 9,000 Ebola cases (confirmed, suspected and probable) spread throughout Liberia, Sierra Leone, and Guinea, we are seeing a devastatingly high need for frontline health workers. The health workers that are on the frontlines where I am currently in Guinea and throughout in West Africa are doing admirably hard work to end this Ebola epidemic. But how many frontline health workers are fighting Ebola and addressing myriad health issues around the world? Unfortunately, due to a lack of data we do not have a clear picture of the number of frontline health workers, particularly CHWs, who are assisting in the efforts. These were just some of the questions the One Million Community Health Workers (1mCHW) Campaign with the Frontline Health Workers Coalition, Johnson & Johnson and others explored in their side session at the Third Global Forum on Health Systems Research in Cape Town, South Africa a few weeks ago. The basis for this panel discussion was a newly published policy report released by the Frontline Health Workers Coalition endorsed by 17 organizations including the 1MCHW Campaign about the difficulty in assessing the state of CHWs within the global community. Panel speakers from Jhpiego, IntraHealth International, the University of Washington’s Institue for Health Metrics and Evaluation and the 1mCHW Campaign provided the context necessary for a dynamic discussion. 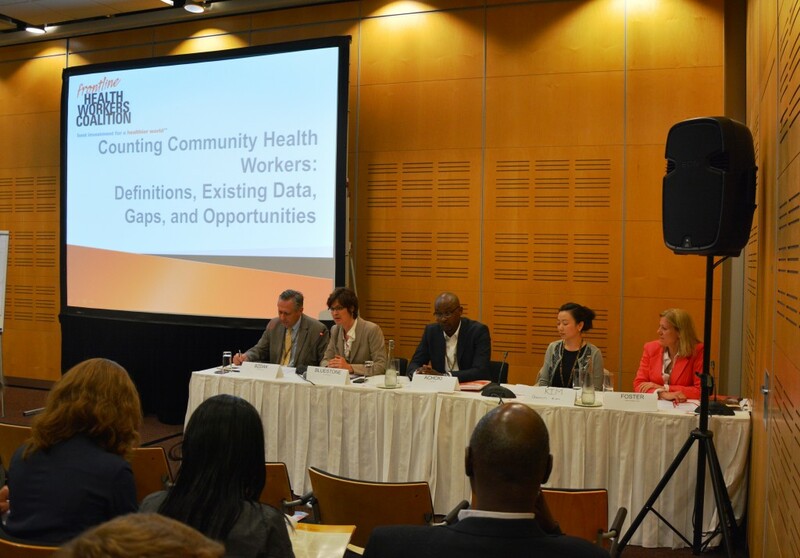 Sept. 29, 2014: Panelists from at the Frontline Health Workers Coalition satellite session during the Third Global Symposium on Health Systems Research in Cape Town discuss the need for improving community health worker data for decision making. Credit: Frontline Health Workers Coalition. During the session, it was widely recognized that despite being invaluable to improving health outcomes in many countries, CHWs are still an “invisible cadre” due to a lack of uniform and organized data. More importantly, the fact that there are many different types of CHWs adds to the difficulty in tracking them—sometimes, the variation in types of CHWs confuses members of the communities they serve. Defining CHWs is only the first part of the solution. After CHWs are defined and professionalized, how do we count them? This question led to an interesting conversation about the need for CHW registries. There was support for the creation of CHW registries. However, it was suggested during the discussion that data should be collected at the local, district and central levels, and it must feed up to the national level. It was also made clear that CHW registries need to be cohesive so that the proper cadre of health workers is counted and tracked. To do this, the development process must involve CHW supervisors and implementers to help plan for data collection; otherwise, the data flow will fall apart at local levels. It was also recommended that data be collected via mHealth systems, which offer promising options to make it easier for governments to collect data and support CHW level supervision. Our panelists and audience largely recognized the value in establishing a universal definition for CHWs and widely supported the creation of national registries of CHWs. A solid definition of a CHW leads to better data, and better data not only enables governments to integrate and support CHWs as key components in their community health systems but also track CHWs’ efficacy over time. In turn, CHWs will be able to serve their communities at their maximum potential. The clearest take-aways from this session and others in Cape Town is that harnessing the power of data is key to both strengthening the CHW workforce, professionalizing the CHW workforce and better understanding CHWs’ impact on health outcomes to inform policy decisions. Knowing this, it is imperative for us in the advocacy community to continue all efforts for CHWs and CHW data collection to finally make these frontline health workers count.